32% to 42% in central taxes, which we accepted in the true spirit of cooperative federalism, thereby transferring significantly higher amounts to the States. Due to a stable and predictable regulatory regime, growing economy and strong fundamentals, India could attract massive amount of Foreign Direct Investment (FDI) during the last 5 years - as much as $239 billion. This period also witnessed a rapid liberalisation of the FDI policy, allowing most FDI to come through the automatic route. 10. Madam Speaker, the last five years have witnessed a wave of next generation structural reforms, which have set the stage for decades of high growth. We have undertaken path breaking structural reforms by introducing Goods and Services Tax (GST) and other taxation reforms. amounting to ` 5.4 lakh crore in 2014. Many more were hidden through restructuring or otherwise which were discovered during Asset Quality Reviews and inspections carried out since 2015.
the health of public sector banks, recapitalisation has been done with an investment of ` 2.6 lakh crore. Amalgamation of banks has also been done to reap the benefits of economies of scale, improved access to capital and to cover a larger geographical spread. changing the mindset of our people. With the people participation, they transformed it from a Government Scheme to a national movement. I thank the 130 core people of the nation for the success of Swacch Bharat Abhiyan who adopted it whole heartedly. at affordable prices through Pradhan Mantri Jan Aushadhi Kendras. as well and falling into clutches of money lenders. each. This programme will be funded by Government of India. Around 12 crore small and marginal farmer families are expected to benefit from this. The programme would be made effective from 1st December 2018 and the first instalment for the period upto 31st March 2019 would be paid during this year itself. This programme will entail an annual expenditure of ` 75,000 crore. after effective implementation of laws and welfare schemes for cows. 30. India is the second largest fish producing nation in the world accounting for 6.3% of global production, registering an average annual growth of more than 7% in recent years. The sector provides livelihood to about 1.45 crore people at the primary level. To provide sustained and focused attention towards development of this sector, our Government has decided to create a separate Department of Fisheries. timely repayment of loan, they will also get an additional 3% interest subvention. from ` 2.5 lakh to ` 6 lakh. Under Anganwadi and Asha Yojana honorarium has been enhanced by about 50% for all categories of workers. our Government programme, defined by a bold yet practical Vision of a responsible and compassionate leadership. Government services or factories. With job seekers becoming job creators, India has become the world’s second largest start-up hub. We are proud of the hard work and innovative ideas of our youth. transparent, inclusive and efficient. MSMEs have an opportunity to sell their products thr ough GeM. Transactions of over ` 17,500 crore have taken place, resulting in average savings of 25-28%. The GeM platform is now being extended to all CPSEs. Scheme in its' true spirit. The Government also announced substantial hike in the Military Service Pay (MSP) of all service personnel and special allowances given to Naval and Air Force personnel deployed in high risk duties. Infrastructure is the backbone of any nation’s development and quality of life. Whether it is highways or railways or airways or even digi12 ways, we have gone beyond incremental growth to attain transformative achievements. energy is reflected in setting up the International Solar Alliance, the first treaty based international inter-governmental organisation headquartered in India. India’s installed solar generation capacity has grown over ten times in last five years. This sector is now creating lakhs of new age jobs. constituted by our Government, has made several specific recommendations, including transforming the system of bidding for exploration, changing from revenue sharing to exploration programme for Category II and III basins. The Government is in the process of implementing these recommendations. digitally delivering several services to the citizens. The Common Service Centres are expanding their services and also creating digital infrastructure in the villages, including connectivity, to convert the villages into Digital Villages. reposing faith in our Government. Let me assure them that we have used their contribution to serve the poor and create better infrastructure. verification and assessment of returns selected for scrutiny will be done electronically through anonymised back office, manned by tax experts and officials, without any personal interface between taxpayers and tax officers. will reduce the interface between the tax payer and the Government for day-to-day operations and assessments. Now returns are fully online and e-way bill system is in place. Inter-state movements have become faster, more efficient, and hassle free with no Entry Tax, check posts, and truck queues. in the 0% or 5% tax slab. Cinema goers who were subjected to multiple taxes up to 50% are mostly paying much lower tax at 12% now. Our Government wants the GST burden on home buyers to be reduced and accordingly we have moved the GST Council to appoint a Group of Ministers to examine and make recommendations in this regard at the earliest. have a roof on its head and will live in a healthy, clean and wholesome environment. We will also build a quality, science oriented educational system with Institutes of Excellence providing leadership at the top. will lead us in this endeavour with innumerable start-ups creating digital India, and millions of jobs in this eco-system. satellites for the World and placing an Indian astronaut into space by 2022 reflect this dimension of our vision. be achieved through modern agricultural practices and value addition. An integrated approach towards agro and food processing, preservation, packaging and maintenance of the cold chain will be our focus of attention. all. Such a healthy India built with the participation of women having equal rights and concern for their safety and empowerment. RE 2018-19 to ` 38,572 crore in BE 2019-20. Allocation for Integrated Child Development Scheme (ICDS) is being increased from ` 23,357 crore in RE 2018-19 to ` 27,584 crore in BE 2019-20. A substantial increase is proposed in the allocation for welfare of the Scheduled Castes and Scheduled Tribes. 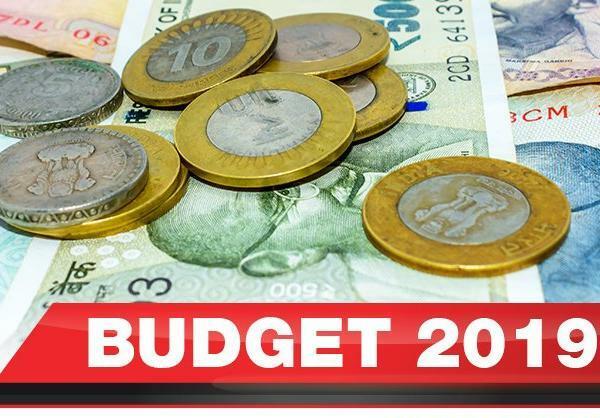 The allocation of ` 56,619 crore made in BE of 2018-19 for Scheduled Caste, further increased to ` 62,474 crore in RE is proposed to be enhanced to ` 76,801 crore in BE for 2019- 20, an increase of 35.6% over BE of 2018-19. For the Scheduled Tribes also, proposed allocation in 2019-20 BE is ` 50,086 crore as against `39,135 crore in BE 2018-19, an increase of 28%. * 12 కోట్ల మంది రైతులకు లబ్దిg కలిగించేలా సరికొత్త సంక్షేమ పథకం.